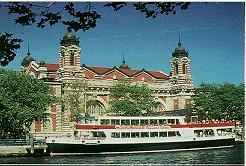 Jersey City History - Old Bergen - Chapter XXXVIII. LATER HISTORY OF THE CHURCH. AT this time there were in what is now the County of Hudson, three churches, the Reformed Dutch in Bergen, the First Presbyterian Church in Jersey City, and a small Methodist Church at Five Corners. 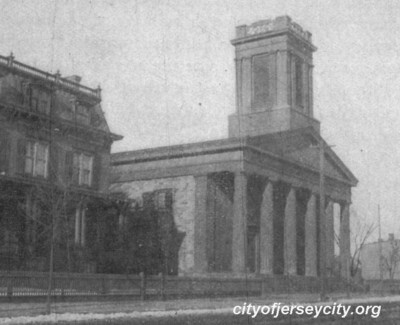 St. Matthew's Episcopal congregation worshipped in the old Town Hall, then used for school purposes, and located near the site of its present building in lower Jersey City. The congregation of the First Presbyterian Church previous to this had worshipped in the old Town Hall for some years, but losing their pastor (Rev. Mr. Olcott), they determined to become a Reformed Dutch Church; by a unanimous vote they decided to unite with the Bergen Classis, and on the 16th of February, 1830, the church became thus duly constituted. The property on Grand Street, now occupied by the Free Reformed Church, which had been deeded by the Jersey Associates to the First Presbyterian Church of Jersey City in 1828, became thereupon the property of the Dutch Church. But soon a demand arose for increased church accommodation, and the community began to discuss the propriety of the erection of other houses of worship. As the population increased and settlements were formed in the outlying territory, it was determined to erect churches in such localities as to accommodate, to a great extent, those families who lived at a distance from the mother church. Hence Dutch churches were established at Jersey City in 1807, and Bergen Neck in 1828; and as the demand continued, these were followed by others. Nor was this the only church growth. As there were many gathering within the territory belonging to other denominations, the need was felt for suitable accommodation for them; and from time to time, in accordance with the demand, other churches were established, until at the present time the confines of " Old Bergen " are studded with the spires of churches belonging to every denomination. Dr. Taylor was closely identified with what might be called the formative period of Old Bergen. When he commenced his ministry, the habits and customs of the Fatherland prevailed to a very great extent, and the rustic population dwelt apart from the follies and vices of the neighboring city, in genuine old Dutch, simplicity. He lived, however, to see many changes effected, and the beginning of many of the improvements and advancements which he predicted, and which have transformed the country garden into town lots, and the quiet, staid farming community into a busy, bustling city. That the "Faith of the Fathers" has been kept in all its purity, is not surprising, when it is considered that it was incumbent on the minister to present once each Sabbath, some portion of the Articles of Belief. As this was divided up, according to the Heidelberg Catechism, into fifty-two "Lord's Days," every year the congregation were regaled with a complete discussion and review of the tenets of the faith, and were thereby strengthened and confirmed in its doctrines. Rev. James L. Amerman Doctor Taylor continued his active pastorate until the infirmities of advancing age made "the grasshopper a burden." The consistory recognizing his failing physical powers, declared him Pastor Emeritus, and issued a call to the Rev. James L. Amerman, who was installed May 7, 1871. A remarkable degree of mutual	confidence	and	sympathy existed between these two, and thus were happily combined the buoyancy and strength of youth, with the wisdom and experience of age. What might be called the joint administration of the two clergymen continued as long as the Old Dominie was able to actively cooperate. He died February 2nd, 1881. Doctor Amerman continued to minister faithfully to his congregation until June 1st, 1876, when, feeling that he was called to perform active, personal missionary work among the heathen, he was at his own request dismissed, and became a missionary to Japan.